If your radon testing kit identifies high radon levels then specialist radon contractors PropertECO can help. There are two main remediation techniques available for lowering your radon levels: installing a radon sump or introducing positive pressure. Our fully qualified team have many years of experience implementing these methods in buildings and successfully bringing radon levels down to an acceptable concentration. You can read more about these two techniques below, or watch our short video to see how they work. A radon sump is a popular and effective choice when it comes to radon level reduction and is the ideal choice for situations where there are high radon concentrations. A void is created beneath the building which effectively becomes the lowest point of pressure. This means that any gas in the soil will be drawn to it. Once the gas has reached the void it can be safely vented away from the property via an exhaust pipe incorporating a fan. The exhaust pipe will discharge any harmful gases a safe distance from the property well away from doors and windows, usually above eaves level. New buildings in radon affected areas often have a radon sump incorporated under the floor at the time of construction, ready to be brought into use if testing shows it is necessary. 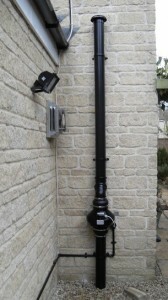 A perforated sump box is usually installed centrally beneath the building with pipework capped-off beside an external wall. To activate the sump, a fan should be fitted to the pipework and the exhaust pipe extended. 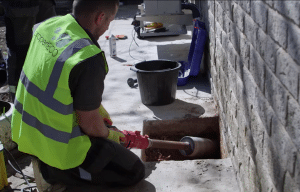 Buildings with a large footprint or properties that have had extensions added may require more than one sump system. PropertECO use sophisticated diagnostic techniques to measure the area over which a sump will have an effect. This also enables our surveyors to determine the optimum location for a sump to be installed. 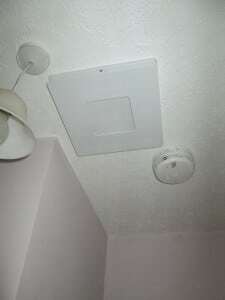 The second method of radon reduction, positive pressure, involves the installation of a special fan in an attic or loft or on the internal side of an external wall if a roof void is not present. 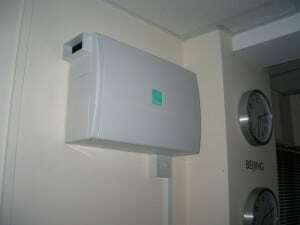 The fan draws clean air into the property and disperses it around the property to very gently pressurise the building. In doing so, this will inhibit radon from the soil from being ‘sucked’ inside, meaning radon levels can be safely reduced. Our highly trained team have many years of experience in designing radon mitigation systems to successfully reduce radon levels to an acceptable concentration. In order to design a radon mitigation system, it will be necessary for us to carry out a survey of the property so that aspects including the size, layout and floor construction can be taken into consideration, as well as the results from a radon test. Following our survey, we will produce a detailed report and specification for the recommended system and provide you with a quotation for the installation. As part of our survey, we are able to conduct a series of ‘grab samples’ to build a profile of the radon concentrations throughout the property. This enables us to identify whether there is an area of particularly high radon concentration, which is likely to be the point of ingress and design a mitigation system accordingly. This diagnostic process may also reveal an obvious defect in the floor construction, for example, which may be easy and cheap to fix without the need for a radon mitigation system, saving you time and money. propertECO installs radon mitigation systems for homes and commercial buildings nationwide. Wherever you are in the UK, we are able to help. Please contact us to arrange a survey.